SCVHistory.com MM0100b | Magic Mountain | Jet Stream Flume Ride, 1972. "The hillsides are still barren as guests enjoy a splashy good time on the new Jet Stream flume ride," seen here in the ride's opening year of 1972, according to a publicity photograph released for Magic Mountain's 25th anniversary in 1996. Jet Stream has delighted families at Six Flags Magic Mountain since 1972. Following the enormous success of other flume rides, it was clear when the park was being designed that a log flume was to be included. Log Jammer was the longest log ride ever built in the US at that time. The flume was so popular that one year later, the park introduced a new twist on the log ride concept and Jet Stream was born. Jet Stream was the first of only seven Hydro Flumes built by Arrow Development. These were variations of the traditional log flume ride, but they had larger boats, double channels on the drop and, most notably, a small speed hill at the bottom of the large plunge. This little hop let the boats skim across the water a short distance before ending with the big splash. Jet Stream was also the first flume ride to use a turntable to dispatch boats into the channel. Instead of log-shaped boats, the new Jet Stream featured traditional, sleeker-looking boats. Still very rare at the time, the ride featured a trough length over 2,000 feet, just as its older sibling had. The speed bump at the bottom, however, was the notable stand out difference, causing the boats to skim across the splashdown. Over time, the decision was made to remove the speed bump at the bottom to give it more of a direct splash such as the other flume ride, rather than the skimming quality. Log jammer was removed at the close of 2011 to prepare for the addition of Full Throttle in 2013. Jet Stream now stands prominently as the park's popular flume ride. When theme parks were rare, new ideas on a grand scale were needed to separate them from the typical amusement parks with carnival rides. The concept of a log flume was a perfect fit. 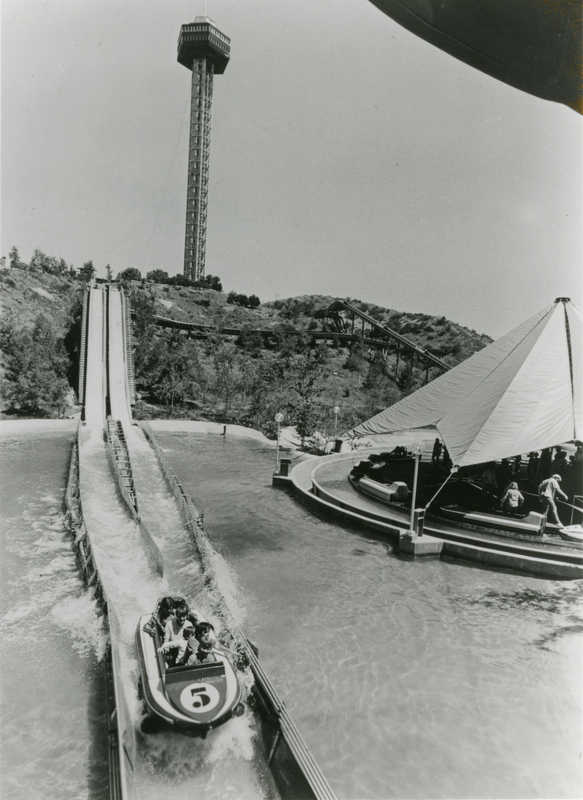 In 1963, Six Flags Over Texas debuted the first ever log flume ride in an amusement park. To say it was a success is an understatement. In fact, it was so popular that the park felt the need to add a second flume in 1968. When Six Flags Magic Mountain was being designed, the management took notice and opened the park with one from the very beginning. As theme parks started appearing in the 60s and 70s, log flumes continued to be the "must have" attraction. The ride was built by Arrow Development Company, who was one of the rare ride manufacturers to provide bigger themed rides. To keep up with the demand for new ideas and larger thrills, Arrow would go on to build mine train coasters and eventually amaze the world with modern looping coasters. Historically, log flumes were used in the latter half of the 1800s to transport logs and lumber down the side of a mountain where it would be received at a sawmill. Flowing water was the method of transportation, and it efficiently helped the transport of the wood over ravines, cliffs, and gorges. Some records indicate that one particular flume spanned over 62 miles in California in 1890. On occasion, workers would climb aboard a log and take a ride to make sure everything was flowing well, and quite probably, for the thrill. While that kind of riding would have been dangerous in the 1800s, it was the origins to the great family fun of the well-known log flume ride. MM0100b: 9600 dpi jpeg from original publicity photo.